If you like the tiled interface of Windows phone that gets you to your favourite apps quickly (and provides quick info on the home screen like unread counts), Launcher 7 is probably worth a look. It's simple on the outside, but actually has quite a few configuration options that let you really tweak it inside and out. You can change the colours of the tiles, change their icons, add or remove apps from the home screen, and even add Android widgets as their own tiles. It's even got some cool animations that you can tweak for performance. When you want to access your other apps that aren't on the home screen, you can access a Windows Phone-like app drawer, that you can tweak to look more like Androids (with several rows of icons). You can also hide apps from the app drawer, or even uninstall them just by long-pressing them if you want. I can already hear some of you asking "Why would you want to make your phone look like a different phone?" Android's UI isn't horrible; in fact many people like it. However, it's interface isn't its biggest plus — whereas Windows Phone's interface is. If the traditional Android home screen is feeling a little tired, it's really worth a look. It heavily revamps the home screen for something new, without skimping on the more advanced features you've come to love from things like LauncherPro. Launcher 7 is a free download for Android devices. It also has a $1.37 Pro version that removes the ads in the app drawer. 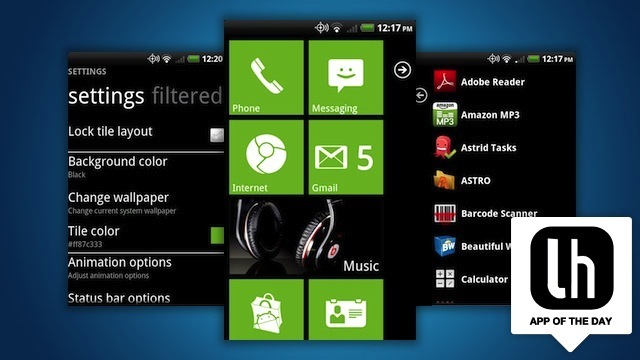 Had doubts about this, as I never really thought much about the WP7 UI (in fact, I thought it looked kinda yuck). Anyway, I tried it out a month or so ago and it actaully was an extremely nice UI to have, and the animations were very smooth. Everything worked nicely. Plus it doesn't have thousands of configuration options like ADW, which I thought was a good thing, but in some cases this might be seen as a bad thing also. If you have doubts, try it out. It's a tiny download and it's very quick to configure and get looking nice. Nice try. Just doesn't come close to the original. Since you like the UX, you better get the WP7 then. Exactly. Why get something that emulates another product that is available? The emulation will never be as good as the original, so why not just get the real thing if you're unhappy with your current products look. I've seen many emulations that actually improve on the original. Let me rephrase that: Why get a copy of another available product? This is far from a emulator. Also, I've seen emulators come along way after the original technology improve on things, but rarely have I seen an emulation of a current product be able to outdo the original. You can feel free to point out some of those many and we'll see if I and others agree with your assessment. This emulator is much better than having a 'real' WP7 phone... because underneath the launcher, there is Android and not WP7. (droid fan)IMO I really dig the look, I may keep it, flash to a different ROM, do something different, make my own. But mine will always be an android based phone. You can keep you WP7 phone. "Exactly. Why get something that emulates another product that is available? The emulation will never be as good as the original, so why not just get the real thing if you’re unhappy with your current products look." Spoken like somebody who can afford any phone they want. I have a <$200 Android phone and can't afford another one. Why not try an emulator for something different? First off, I apologize for my statment making this sound like I believe this to be an emulator. It far from emulates the functionality of WP7. Ok, in response to you query. I'm not necessarily against someone trying a different look on their phone. Being able to change things up can be very appealing to many. However, I'm not really into copying a competitive products design to that degree. That all copy and try to keep up with each other, but to try and make one product look like another product that does the same thing, ridiculous! Windows Phone 7 can easily be picked up cheaply as can Android, so cost if not a major issue for most. For the most part, if you can afford all the costs that come having a smartphone, you should certainly be able to pretty easily afford a new phone. If finances are that tight, maybe a smartphone isn't your best bet. It's not like it's a necessity for many, but a convenience. I use my devices for both work and pleasure as to many others, but the vast majority don't really need smartphone functionality at this time. If you're one of those, go back to a phone that give you phone funcionality and come back to a smartphone when it's more in your budget, but don't complain about not being able to afford an upgrade they costs very little with a new service contract. So you're saying, that you shouldn't try out a free launcher for fun, but instead go off and buy a new phone for $200+ instead, because if you can't afford to buy new phones every 5 minutes you shouldn't own one? Nope, I'm not saying that at all. I'm saying if your so into another phones design than why not get that phone in the first place. I have no desire to make my WP7 look like and Android or iphone, just as I had no desire to make my iphone look like a competitors when I had it. I am happy with the design of the my current phone and if I loved the design of an Android so much, I would get and Android. Like I mentioned though, I'm all for being able to personalize a phone and if making it look like another phone out there appeals to you or anyone else, by all means, feel free. However, If you want your Android or iphone to look like a WP7 than why not just get a WP7? Part of the appeal of these phones is the differences between them and that's a big part of why people pick one platform over the other. Not the only reason for sure, but it certainly it plays a part in the decision. I don't try to make my PC look like a Mac, because if I wanted a Mac, I'd have a Mac. I also don't try to make my Macbook Pro look like Windows, because once again, if I wanted a windows laptop, I'd have a Windows laptop. Feel free to do as you like, but I still won't get why you want your choice to look like another choice you could have made. If I wanted a UK (University of Kentucky) shirt, I'd buy a Kentucky shirt, not a UK (University of Kansas) shirt) and than try and claim the UK stoo for Kentucky rather than Kansas. If I wanted a pair of Nike's, that's what I'd get. I wouldn't get some Reebok's and than try and make them look like a pair of Nike's. You get my point. Others can do as they wish, but no matter how much they try and justify it to me, it will make little sense. Thank you for your common sense!!!! A bit late but anyway. A good reason is that you may like the look and feel of the Metro UI but want to use applications that are coded for Android. For those users you get a good compromise. Going to WP7 would rob you of the Android compatibility if it matters to you. As for your mac example. A lot of people do put Windows on a Mac if only to dual boot, for much the same reason as I previously mentioned. Apple doesn't make bootcamp available just because it can.